Eight years after Germany decided it would halt nuclear power production by 2022, the country that relied on lignite and hard coal for 38% of its generated power in 2018 will phase out coal by 2038 or earlier. While some experts said the decision could have grave implications in the medium- and long-term, others argued it was a historic milestone in Energiewende, the country’s energy transformation to a low-carbon, nuclear-free economy. The decision was announced on Jan. 25 by a commission appointed in June 2018 by the government; it included 28 voting members from industry, academia, environmental groups, and unions, along with three non-voting members from Germany’s ruling parties. The panel’s recommendations essentially outline a roadmap that could allow the country—whose economy suffered the weakest rate of growth in five years in 2018—to transition beyond coal by 2038 without much pain, and they include proposals of €40 billion ($45.7 billion) in aid to affected regions. First, power generators—including companies that recently restructured to stay profitable as subsidies sent renewables growth soaring—will be asked to shutter 12.7 GW of coal capacity by 2022. By 2030, another 13 GW to 17 GW would be closed. No schedule has been provided for which power plants will be mothballed first. The targets assume that decommissioning will be settled through negotiations, with the aim of mutual understanding, with power generators, but the proposals also provide compensation payments to bolster cash flow investments, as well as to support employees. The roadmap will also be reviewed repeatedly over the next decade. In January, Chancellor Angela Merkel’s cabinet embraced the measure. Economy Minister Peter Altmaier said on Twitter, “Less CO2, more new jobs. Security of supply and affordability: a strong signal!” But industry stakeholders, predictably, lamented the measure. According to credit ratings agency Scope Ratings, among German utilities that will most feel the impact are: “RWE; a list of German municipal utilities either through direct exposure or indirect exposure through Trianel and Steag; Czech utility EPH, but also some significant exposure for EnBW, Uniper, Sweden’s Vattenfall and France’s Engie” (Figure 1). The decommissioning could also affect Uniper’s Datteln IV hard-coal-fired power plant, the only coal-fired power plant currently under construction, which is scheduled to go into production in 2020. Scope, which noted that many coal-fired power plants in Germany are operated under long-term offtake contracts, predicted these companies will likely stage a battle to protect their bottom lines. “We are sure that affected utilities will use all available opportunities before the government takes measures to incorporate some or all of the coal commission’s recommendations into law to oppose sacrificing their assets for the sake of Germany meeting its carbon-reducing climate goals, particularly if potential compensation payments turn out to be unsatisfactory,” it said. Scope also forecast public pushback, noting that Germany already has some of the highest end-customer electricity prices for residential and industrial consumers in Europe. How the decision will impact Germany’s energy reliability is less clear. 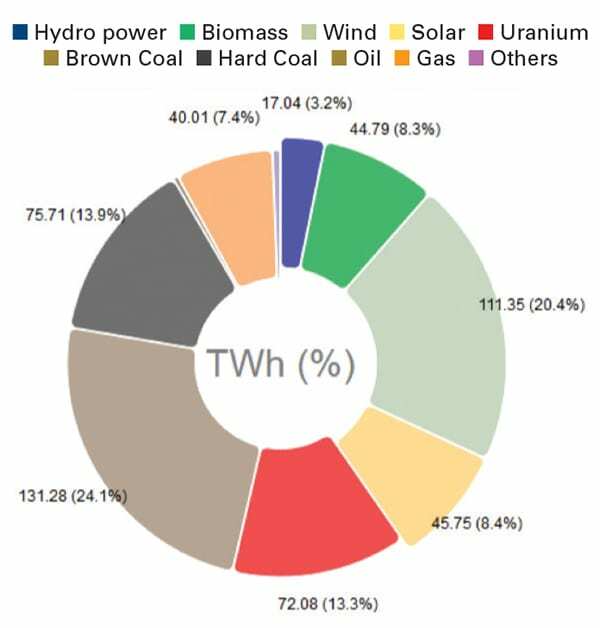 Munich-based German researcher Fraunhofer Institute pointed out on Jan. 4 that solar and wind turbines produced 157 TWh of the country’s power in 2018—putting them ahead of lignite, hard coal, and nuclear energy (Figure 2). A total 45.5 GW of installed solar photovoltaic (PV) fed 45.7 TWh into Germany’s public grid in 2018, up 6.3 TWh compared to 2017. Wind produced 111 TWh, 5.4% higher than in 2017, from 52.7 GW onshore and 5.86 GW offshore capacity. Hydropower produced only 17 TWh—the second-lowest value achieved in the last 30 years—compared to 20 TWh in 2017. About 44.8 TWh came from biomass, with no change from the previous year. Nuclear plants produced 72.1 TWh, also the same as 2017. Though they reacted more flexibly to low exchange electricity prices, lignite-fired plants produced 131.3 TWh net, about 2% less than in 2017, and hard coal–fired plants fed 75.7 TWh, about 7.4% lower than in 2017. Gas plants (not counting captive plants) produced 40 TWh, 18.5% lower than in 2017. In 2018, meanwhile, Germany had an export surplus of about 45.6 TWh, only a slight decline from 2017. Much of those exports went to the Netherlands, which then transmits a large part of its power to Belgium and the UK; and then to Austria and Switzerland, which forward it to Italy; and Poland, which transmits part of it to the Czech Republic and back to southern Germany. Germany also imported 8.3 TWh from France, which depends on nuclear for the bulk of its power. Over the medium- to long-term, substituting renewables and gas power for coal will likely be “challenging,” Scope said. “While it is estimated that renewables have already covered almost 40% of Germany’s electricity needs in 2018, this coverage refers to the annual average, with days where the lack of renewable energy is buffered by thermal generation capacities,” it noted. Assuming coal and nuclear are both phased out, nearly half of Germany’s present-day generation volumes will need to be substituted (Figure 3). That could mean windfalls for utilities with high renewable capacities and independent power producers, who would likely have a stronger position to contract capacities under power purchase agreements. The importance of interconnections with Germany’s neighbors will also likely grow, but it will saddle energy suppliers and traders with increasing challenges to lock in satisfactory margins as they compete with non-German power suppliers, said Scope. Grid operators will also need to pour more investment into infrastructure—including gas transport, energy storage, and power-to-gas facilities—to cope with fluctuating generation. Finally, the country’s experiment with power subsidization is bound to become more complex. “While the recommendations of the coal commission include potential subsidies on energy prices, e.g. feed-trough tariffs of transmission and distribution system operators, it could also increase pricing pressure on such grid operators in the next regulatory periods as subsidies on energy prices have to be collected by the government to the detriment of other areas,” Scope said.